Home > US Sports > NHL > Adios, Voynov! 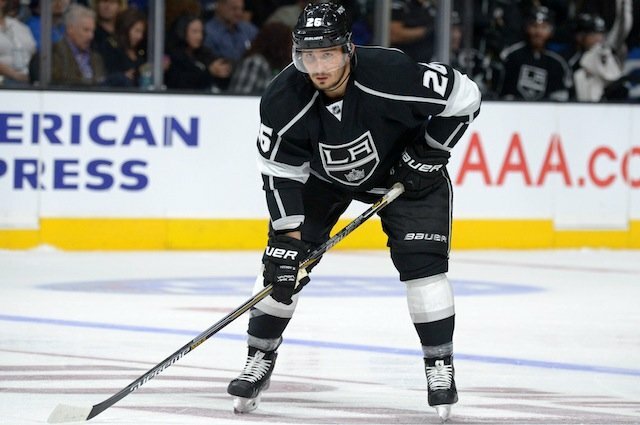 Los Angeles, CA– Slava Voynov, star defenseman for the Los Angeles Kings, has been officially charged with actions related to domestic violence by the L.A. County District Attorney’s Office. Having not played since Oct. 19, it’s hard to say whether or not Voynov’s official having to leave the team will have a significant impact on the rest of the Kings’ season. And if it does, it will be felt most heavily when the Kings (if the Kings) make another NHL Playoffs appearance. News of his official being charged and also scheduled arraignment broke Thursday afternoon via ESPN’s Katie Strang. Voynov is scheduled for an arraignment on Dec. 1, according to Strang’s sources and report. Fans should be incredibly proud for how the NHL handled the situation. Once word was received about what Voynov’s situation and actions were, the league immediately suspended him without giving a date for a comeback. If the NFL had done that the first time news of Ray Rice’s domestic violence issues broke, the situation in the National Football League and their approval rating would be very different (and better). Once word of new details regarding the situation with Slava Voynov come to light, World In Sport will have an immediate update for you, but as for now there are no further details to disclose.